For Maine Marathon, Visible Logic designed their updated brand identity, revamped their web site and sent out a series of e-newsletters to promote the event with a high click-thru rate that led to an increase in signups. The Maine Marathon is the largest annual event of the Maine Track Club with almost 3,000 runners. Entering its 26th year, a new race director took over the event and was eager to update the overall look and feel. 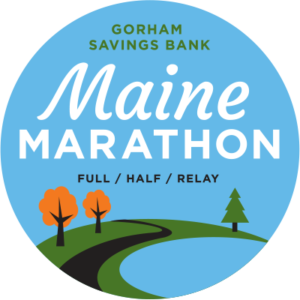 The event donates over $100,000 to Maine charities each year and increasing their charitable giving through additional runners and partnerships is a priority. In a world increasingly filled with glitzy half marathons, triathlons, and color runs, the Maine Marathon had been experiencing a decrease in race registrations for the past two years. The long-time race director and existing volunteer team had focused on executing a great race day experience but had not prioritized having a professional brand image or actively marketing the event to potential participants. The logo looked dated and didn’t accurately convey the quality of the event. The website contained a lot of information but was difficult to navigate and information was not always current. Marketing efforts to potential participants were limited, and communication to registrants missed opportunities to activate their core customers. Social media accounts on Facebook and Twitter had been neglected, so potential runners weren’t being reminded that this was something they should sign up for. Starting with a survey of the Maine Marathon leadership team, Visible Logic identified several key qualities that made the Maine Marathon appealing and different from other events. Although identified as important to the leadership team, these valuable traits were getting lost in a sea of information when communicated to runners. Visible Logic helped the Maine Marathon refine their positioning: the race is a community run event that benefits the community. This clarity helped us to target potential runners with a compelling value proposition. A new logo backed up by a redesigned website, a detailed twice-monthly email strategy, and social media campaign on Facebook, Twitter, and Instagram were the mediums chosen to create a cohesive marketing effort. The goal of the updated logo design was to communicate at a glance that this was a modern event in a beautiful place at arguably the best time of year. One of the most notable things about the Maine Marathon course is the start and finish around Portland’s Back Bay—this was alluded to in the logo, along with the colors of the fall foliage. The type chose for the event name is reminiscent of classic Maine signs without being old-fashioned or derivative. 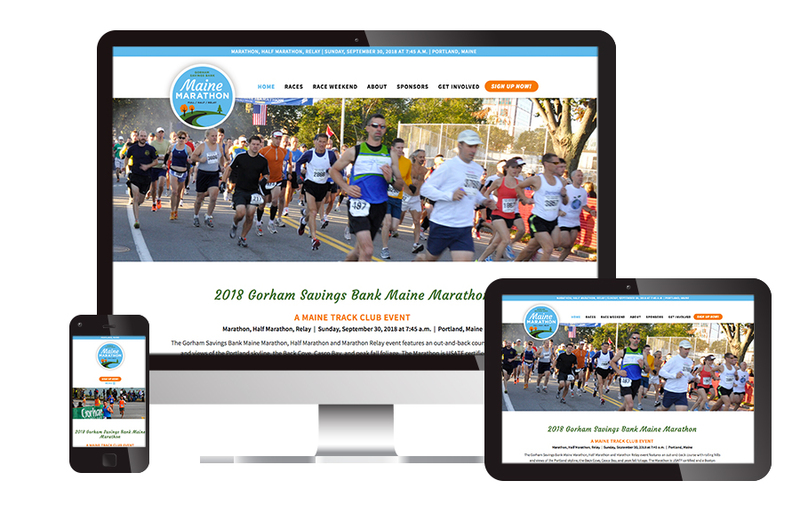 The Maine Marathon website was the first priority after the completion of the logo. Driving potential runners to the website for more information meant that we needed to ensure that information was accurate and easy to access. Integrating the site with RunSignUp, used by the registration team, ensured seamless management of participants. Visible Logic also refined the registration process on RunSignUp which led to a dramatic increase in donations to the Maine Marathon’s charity of choice. 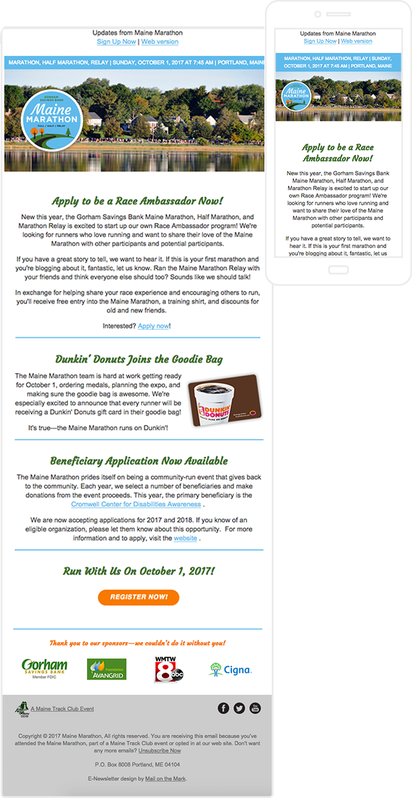 Mail on the Mark, Visible Logic’s email marketing platform, was used to promote registration, pre-race events, and special offers to prospective and signed-up runners. A total of 8 e-newsletters reached almost 12,000 people and notable increases in registration occurred after each was sent. Tying the content to registration activities including price increases and event-specific dates ensured that the emails were of interest to both runners who had already signed up and those who might be thinking about doing so. We also sent the first ever “virtual goodie bag” to runners that had coupons and special offers. There was an incredible 70% open rate on that email to 3000+ registered participants. Visible Logic built out a social media plan and worked with the Maine Marathon to implement it with the active assistance of Maine Marathon volunteers. VL provided additional graphics and coordinated timelines to ensure that social media promotion was integrated with other campaigns. Starting with training shirts that were put on sale several months before the event, Visible Logic designed and provided design guidance on a wide range of event materials. In this first year of a new brand identity, many items were created using the new logo including print ads, signage, items for sale, runner t-shirts, and goodie bags. 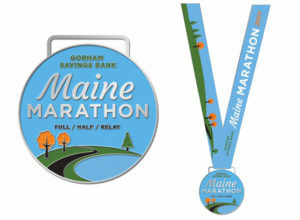 The updated brand was extremely well received by both the Maine Marathon team and the running public. The enewsletters had a very high open rate and registration increased after each one was sent. All social media accounts had a notable increase in followers as well. In addition, the amount donated by runners to charity increased dramatically, and registration remained stable after a two-year decline. Sales of merchandise were very strong, with many runners purchasing more than one item at the pre-race expo or on race day.